Local Emergency Planning Committees (LEPCs) were established in accordance with the federal Superfund Amendments and Reauthorization Act, Title III, Emergency Planning and Community Right-to-Know Act (EPCRA) of 1986. All LEPCs must develop an emergency response plan, review the plan at least annually, and provide information about chemicals in the community to citizens. The Baltimore City LEPC exercises its role with respect to hazardous chemicals and it has expanded its scope to include all-hazards preparedness. To learn more about EPCRA, please visit www.epa.gov/epcra. The Baltimore City LEPC is chaired by the Mayor's Office of Emergency Management (MOEM). An advisory committee is appointed by the State Emergency Response Commission (SERC) and provides direction on LEPC activities. Click here to view the Baltimore City LEPC By-laws adopted in 2008. 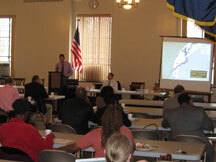 The Baltimore City LEPC meetings generally take place on a quarterly basis. Each LEPC meeting features speakers who present on topics of interest to the preparedness community. Members have an opportunity to report on programs, recent activities, and upcoming events, as well as network with colleagues. You can make a difference by joining LEPC and attending the meetings. For more information about the Baltimore City LEPC and how to join, please contact [email protected] or call (410) 396-6188. The Maryland Department of the Environment (MDE) has implemented an online reporting system for facilities to use for reporting their Tier II Emergency and Hazardous Chemical Inventory Reports. These reports, required by Section 312 of EPCRA, require covered facilities to provide detailed reports about the hazardous materials they use or store on site. The reports are submitted to the SERC, the LEPC with jurisdiction over the facility, and the local fire department that would respond to any emergency at the facility. Click here to learn more about MOTTRS and Tier II reporting.